Manchester City produced a fine performance to record a rare victory at Old Trafford. Sir Alex Ferguson played two attack-minded wide players, with Ryan Giggs in the centre and Tom Cleverley only on the bench. Phil Jones continued alongside Rio Ferdinand in the centre of defence. Roberto Mancini left out Sergio Aguero, favouring Carlos Tevez as a lone striker with David Silva just behind. City were significantly better here – they dominated the first half, took the lead in the second, and Mancini used his bench better too. The first few minutes were played at an extraordinarily high pace, with closing down, fierce challenges and the ball travelling from end to end quickly. Once the match settled down into a much slower tempo, the approaches and formations became clear. City were their usual 4-2-3-1ish shape and seeking to dominate possession, while United – with Wayne Rooney high up, as more of a second striker than a proper link player at times – were more 4-4-2ish. Rooney dropped onto one of City’s midfielders, often Yaya Toure, when City had the ball – although he did so casually, as if it wasn’t a major part of United’s gameplan. At the other end of midfield, Silva dropped back onto Carrick. 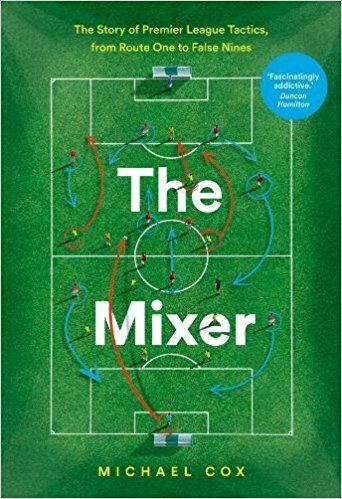 Sometimes it’s difficult to tell whether a side is simply being outpassed, or are deliberately playing a reactive, counter-attacking game. For United, it was probably a bit of both – Ferguson surely didn’t intend to allow City continual possession in great space close to the United box, but the use of two direct wide players indicated a desire to play on the break. Welbeck had a good counter-attacking opportunity early on, but took the wrong decision, failing to play in Rooney down the right. 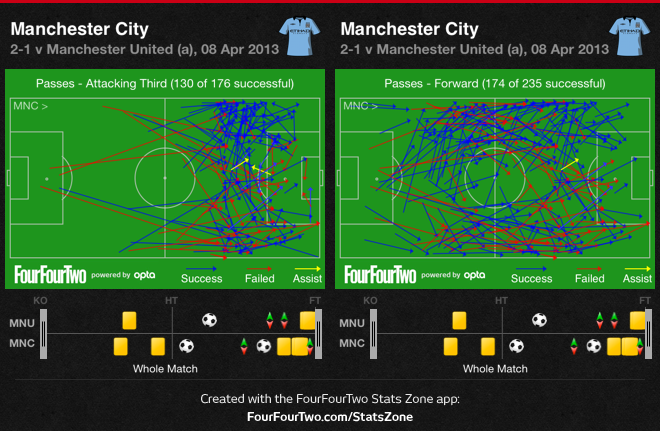 From early on in the first half, there was one obvious theme – City’s focus on playing down the left. Their recent league victories against United have always been based around overloads in wide areas. They took control in the 1-6 because Silva and James Milner crossed the pitch diagonally to combine with each other, then they dominated the crucial 1-0 at the Etihad when Ryan Giggs was sucked in from the left, allowing Pablo Zabaleta and Samir Nasri to create 2 v 1s against Patrice Evra. There were a variety of positional reasons for the dominance down the left, suggesting it was a deliberate tactic from Mancini. Silva played as a central playmaker, but always drifted to that flank in the first half – Tevez did the same from higher up, playing up against Ferdinand rather than Jones. …while James Milner (after getting in behind Patrice Evra a couple of times in the first ten minutes) made a couple of runs that replicated his movement in last year’s fixture. With Welbeck often taking up surprisingly narrow positions, Gael Clichy had time on the ball, too. Equally crucially, United gave City space to play in. At Stamford Bridge last week, while the game was 0-0, United minimised the space between the lines and denied Chelsea’s playmakers time on the ball. This match couldn’t have been more different – Jones and Ferdinand sat particularly deep, while Carrick and Giggs seemed overrun in the centre of the pitch, forced to get through a lot of running rather than protecting the back four solidly. City were penetrating the space either side of Ferdinand too frequently, and Jones was frequently forced to cover. City simply had space to play – Silva darted into the space between Rafael and Ferdinand, Nasri into the space between the lines. Barry’s movement towards the flank was, understandably, tracked by no-one – but it was still a crucial role in asserting City’s dominance, as the most frequent passing combination was between him and Clichy. The only surprise was that City didn’t lead by half-time. For United’s part, there was barely a chance to assess the quality of their counter-attacks, because the first pass out of the defence was so frequently poor. The second half was more open than the first, and probably more balanced – but there were few significant tactical shifts, with only one substitution occurring before Aguero’s winner – and that was his introduction. 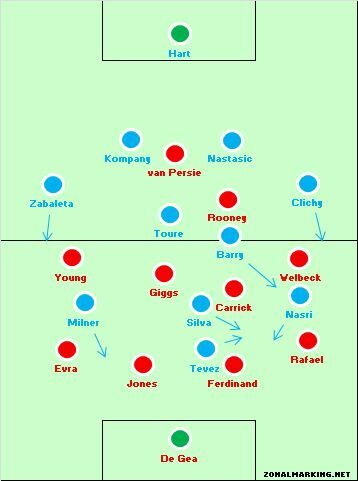 City’s goal originated from the left flank, and a Giggs error. It was hardly a typical pattern of play, but it somehow summed up the game nicely – City were always attacking down that side, while Giggs was arguably the game’s weakest player, unable to deal with City’s movement in the centre of the pitch. Milner’s strike was deflected, but it was the second consecutive season he’d had a decisive impact at Old Trafford. United equalised with Vincent Kompany’s unfortunate own goal, following a Van Persie free-kick. Maybe the key tactical feature of that goal was Toure conceding the free-kick in the first place – it was a good example of how he was often playing a more defensive role, as Barry was in an advanced position. At 1-1 there was great crowd noise, a succession of strong tackles and attacking intent from both sides. The momentum was with United, who pushed higher up the pitch. Then came the only important substitution – Mancini bringing on Aguero for Nasri. The Frenchman hadn’t played badly, but he was certainly the least effective of City’s attacking quartet. With Silva moving left and Tevez dropping deep, City now had renewed energy upfront, and a player with incredible acceleration to sprint in behind a defensive partnership that sometimes appears vulnerable to pace, although the goal came in a much ‘tighter’ situation. Maybe there’s nothing clever in throwing on a £40m striker to increase your attacking threat – but Mancini got his decisions right. Tevez started upfront and linked with Silva nicely, helping City to assert their dominance, then Aguero was introduced to provide a sudden spark. City started better, with their attacking players linking nicely, particularly down the left. Clear goalscoring opportunities were rare, but City put United’s defence under pressure – and with the home side barely counter-attacking to test Joe Hart, for the majority of the game City looked more likely to score. United’s approach saw them overrun in the centre of the pitch, and it was surprising Ferguson persisted with his starting shape for so long – bringing on Cleverley, to narrow the midfield and help United compete in the centre, seemed an obvious move, while Kagawa could have been introduced significantly before the 92nd minute. This could be Mancini’s final Manchester derby. Some have questioned precisely what he brings to City – but in head-to-head clashes against United, he’s generally outmanoeuvred Ferguson. While Manchester United deserve the Premier League title, there is a real lack of quality in United’s lineup. Other than Van Persie, Rooney (who turns off when they loose the ball, not really a modern attacking player), Carrick (who isn’t the same quality of Xavi, Alonso, Pirlo, Schweinsteiger, and Gundagon), and De Gea were are their elite level players? Kagawa doesn’t play or fit their style of play. Jones,Clevery, Rafeal, Evans, and Smalling are all inexperienced. Giggs, Scholes, Ferdinand were great but are role players now, and Young, Evra, and Valencia are not good enough. …and yet they’re still 12 points clear on top. What exactly is your point? Just look at what happened in europe. stuttered thrrough very poor group (good chance of not getting through if in citys or chelseas), out in the lasst 16.
man u are a decent team in a poor league. next year will be different. chelsea could be better if the special one is back. city willl be better, if you think uniteds performance has been enough this year, goodd luck. Stuttered through a poor group? You mean they won the group after 4 games then played their reserves? Save for an intervention by a Turkish ref, they would have beaten Real too. What makes you think United won’t improve as well as the other teams? And you point out above the inexperience of half the squad – yet they’re still winning the league! Imagine what they’ll be like with experience i.e. next few years. Goodd luck to the others, indeed. Stuttered? for example, 1 – 0 down and playing dreadfully against romanian no hopers, before the keeper chucked away 2 goals. This is what i mean by stuttered. yes they got through after 4 games, but if you think they played well you are kidding yourself. yes the objective is to get through, but as per last year, sometimes performance can be important as well. united cannot at this momeent class themselves alongside the best in europe, yes they may improve, by investing in a new midfield would help. without the investment they will go nowhere. as for the league, they have won it, well done, however if you think city and chelsea wont be better next year, fine, but i think AF thinks they will be and will invest as a result this summer. I don’t really recall a “perfectly good goal chopped off”. However, I do recall a not given red card to Raphael Varane in the first game for a foul on Evra going clean through (no foul was even given…). Anyway, refereeing aside, ManU and English teams in general do seem to have fallen behind top class German and Spanish opposition. People have been saying stuff along these lines for the last few years, yet there still being successful. Last 3 years, 2 Premier League titles and also a Champions League Final, and this year perhaps would have reached Semi’s if they wasn’t unlucky to be drawn against Madrid, and then unlucky in the actual game. They’ve just got a ruthless winning mentality, installed by Ferguson who obviously has to take a massive amount of credit for their continued success, and also for continually getting the absolute best from players. It’s true, City and Chelsea have far better players than United, but it’s arguably still United who are more successful at the current moment in time. You mention Carrick, but you can’t compare him with Xavi, Schweinsteiger or Gundagon because there different types of player, but is Carrick really that far behind Alonso or Pirlo? The media and ‘experts’ have only just started picking up on how good Carrick actually is. This is his best season in a United shirt, but he’s actually been a top level performer for years now, and it’s criminal how England have wasted his talents. He does the role of a modern holding player superbly. Intelligent with his positioning, and very good on the ball. 75% of Carrick’s passes have gone forward this season, and he has an 84% pass completion rate, very impressive stats. Alonso has gone up the levels recently, absolutely top, top player, but I think Carrick could do the role Alonso plays. The way Madrid play is actually very suited to Alonso, sitting deep with the likes of Ronaldo and Di Maria ready for his passes on the counter attacks. Pirlo is slightly overrated in my opinion. Still a top player of course, but it seems he’s getting so much praise for this 1 game against England. England gave him as much room as he wanted to absolutely control the game that day. Who was marking him that game? Rooney. Who as has been mentioned in this article for carrying out his defensive duties poorly. Pirlo does have a fantastic range of passing, but if any top midfielder was given that amount of time and space, they could spray balls round for fun all game long. If it wasn’t for that game I don’t think he’d be as highly rated as he is now. He was deemed surplus to requirements at Milan not so long ago, a club who apart from 1 game this season have been woeful. Pirlo overrated? Arguably the most important player for Italy NT of the last decade & the greatest in the deep-lying playmaker role, Pirlo would only be overrated in the eyes of those suddenly over hyped him after Euro 2012. The “rest of the world” had already noticed his games since 2003/2004 season at least. I suppose you don’t follow Serie A. If that is the only clever thing you can say than you should shut up. Or Gundagon & Rafeal haha. you have said the the truth, there have little quality, but its one thing to have quality and another to have the winning mentality and determination which has accrued from winning with quality players and effective players who were at top form in the past. Man utd is a team with incredible mentality and determination which explains why there can come back from one or two goals to win a match, and this mentality is one thing other thing Arsenal in particular will desperately need, apart from quality players. In truth, this season has been truly poor not only in England but in other European domestic league, Man utd still have winners Giggs, Scholes, Ferdinand and so on who inject the right mentality and belief in the team, not like other clubs who sold the players that won them trophies used to win trophies. lastly, to be honest, i think this season’s fixtures somehow favored Man utd. Is there a reason why United lost every big clash after winter? I would say van Persie’s loss of form is significant, but is there something else? An antiquated system from what appears to be an increasingly sepia toned myopic management team. 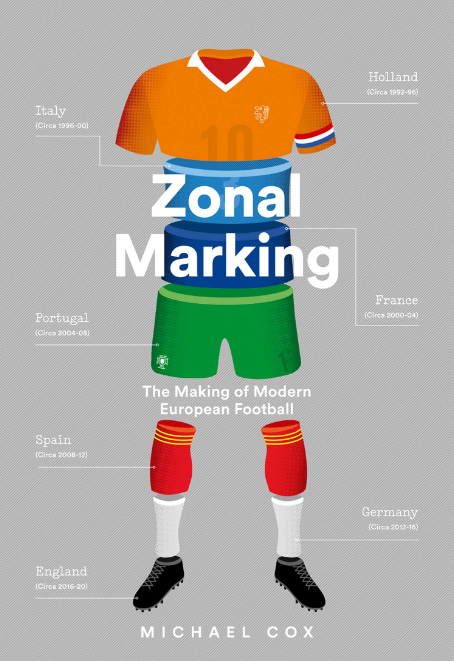 An utterly predictable formula with utterly predictable results. In a game in which a draw would have been a perfectly acceptable result for the league leaders surely only the most naive would start with a formation which plays so considerably into his opponents hands. To change formation at this point in the season, and against such a fierce rival may prove to be foolhardy, however, given the points difference, why not see this as an opportunity to explore new avenues; after all, if you’re not going to try and shut up shop to deny your opponents, effectively closing out a game before it has begun, why not look to take the initiative. why not experiment a little and search for a more progressive system. Why not try playing with a midfield consisting of say, Carrick and Jones sat more or less at the base of a triangle, with Kagawa at it’s tip, ahead of which a front three of Rooney and van Persie are given an element of freedom to roam in support of a centreback fixing Hernandez. A mere idea, in which I’m sure there may be many holes, but given how the Manchester United wide players have under-performed this season, coupled with an apparently soft underbelly through the centre of the park it might just be worth thinking about. As a United fan, I really do hope that this formation is used more often, it just seems to fit our current players’ strengths better. Your suggested lineup in particular would be ideal, and would give Kagawa the central role he deserves. I was especially impressed how City managed to play many straight through balls through United’s midfield, bypassing almost the entire line at once and how City’s attackers (predominantly Tevez) were able to receive them with their back to the goal. I was equally surprised how United midfielders did not pressure, e.g. Toure who would play these kind of passes often and how United defenders allowed City’s attackers time and time again to receive the ball (perhaps Rio is not mobile enough to deal with Tevez, compared to Jones, and that is why City also chose to play through the left). All in all, this was probably a result of the space United allowed inbetween the lines and I think this was a major problem for United in this game. Too much space and midfield not quick enough to run back and make up for lack of pressure/lack of compactness. When City approached the penalty area, it was a safe bet they would have enough quality to break the defence down. united have a very weeak midfield. carrick can play well, but was poor last night and against real. i feel he can be a bit of a flat track bully. the rest of the cms are either past the top level (giggs, scholes – however good they were in the past) or simply not there (maybe yet in the case of cleverly but we will see). when yoyu compare citys cms last night to uniteds, there was no contest. barry was excellent and toure effective. AF needs to massivly strenghten here over the summer if he wants united to compete next year, not only in thee champions league, but for me also from a better city who will improve this year over the summer to be the threat in the league. i think he missed a beat with dembele going cheaply to spurs and lets face it, AF does not have aa great record in buying CMs (veron, djemba djemba, kleberson, anderson). one other thing from last night. rafael was again shown to be the ‘highlights’ fullback he is. can be okay going forward (though he was poor in possession last night) and hit the bar (the bits the highlights would pick up) but his defensive work and allround game was poor. bit of a curse of the modern game this when full backs are judged on what they do in the opponents half. he was also very poor against real madrid. Disagree completely about united struggling in the CL. We don’t know how the 2nd leg against Madrid would have turned out if it would have been 11 v 11 but they stood toe to toe with them. Even Mo said the better team lost. As for tonight, I’m kind of over Rooney. He’s offering very little to the attack and almost nothing to the defense. Might be time for SAF to cut him loose. they stuttered through a poor group (yes mabe the only objective was to qualify, but when you add this to last years non qualification from an equally poor group a trend starts to emerge) and it is it not outwith the realms of imagination that if they had been drawn in city or chelseas group for example, they may not have made the last 16.
as for the games with real, yes madrid were poor in the 2nd leg up to the red card, however they had already seen a goal wrongly chopped off for offside and a blantent deliberate hand ball on the line. what else should real have to do? as for the first leg, united were outclasssed but for poor real finishing and some very good saves by de gea. 1 1 was the score but could easily have bee something quite different. my original point was that man u were thee best team in a poor leagu this year and i stand by this. as for european competiton, they need serious strengthening, or they will fail againn next year. Ferguson tactics were suicidal.United’s line up was something like 4-1-5?It was the last big game for them this season and it would’ve been plain logic to play your best performer’s of the season in your most succesfull formation this year – midfield diamond with Cleverley,Carick,Jones and Kagawa. As previosly said, it is amazing how much space United alow to their opponent’s. This is Ferguson’s usual approach to games where he thinks that United can’t compete, tweaked to fit the opposition but following the template. You could argue it’s a tactical blindspot of his, these tactics invariably work against Arsenal & Liverpool but Mancini has the acumen to work around them. I thought put in their best performances of the season, mainly because of silva playing centrally. Im surprised city don’t play him there more, as he controlled the midfield and linked excellently with tevez. United’s big problem is that their attackers are out of form, rvp is not scoring, rooney looks low on confidence and welbeck is looking fatigued I think. I would have liked to have either rooney behind hernandez as their partership helps get the best out of rooney or kagawa behind rvp as he looks in better form than most of uniteds attackers. The same can be said of their wingers as young, nani and Valencia are all out of form. I also thought that giggs in midfield was a bad decision against a team full of creative players who like to play between the lines. And now that you have covered the less interesting derby of yesterday. How about your opinion on Roma V. Lazio? i really hope that Mancini will stay for another season.